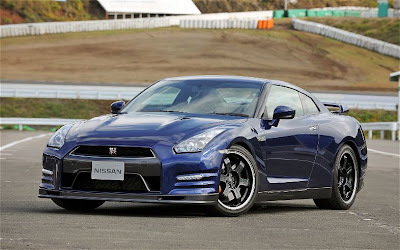 The Nissan GT-R Track Pack, if you are located in the US, is something that you won't get to see.At least from all reports not likely to see. Nissan does not seem to be slowing down on producing several different models of the Nissan GT-R. Base, Premium, SpecV, Egoist, and Pure. Now that the SpecV is discontinued, a lighter and higher performance model was lacking in the lineup. Motor Trend took a first drive of the 2013 Track Pack and just put it up on their site. Head on over there and check out the full article and pictures. The narrow brake ducts built into the front lip spoiler and the unique Rays alloys on the Track Pack special edition are about it. 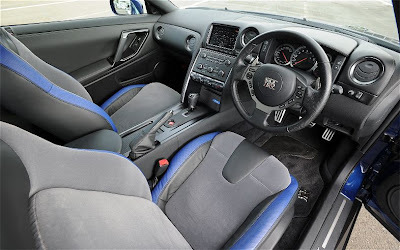 Inside, mod-spotting is a little easier as the Track Pack gets specially fitted slip-resistant seats and, well, no seats in the back. Spring rates at all four corners have also been modified to generate a more compliant ride while delivering even flatter cornering potential. We notice that the cornering g meter on the dash reads 2.3 g, and are not surprised to see a figure of 1.6 g pop up as we stomp on the brakes for a tight hairpin. We later hear that chief engineer Kazutoshi Mizuno's team has recorded a maximum of 2.8 g in the corners and 1.9 g under full braking at the Nurburgring.